DeKalb County History Center Grand Opening! Name: DeKalb County History Center Grand Opening! 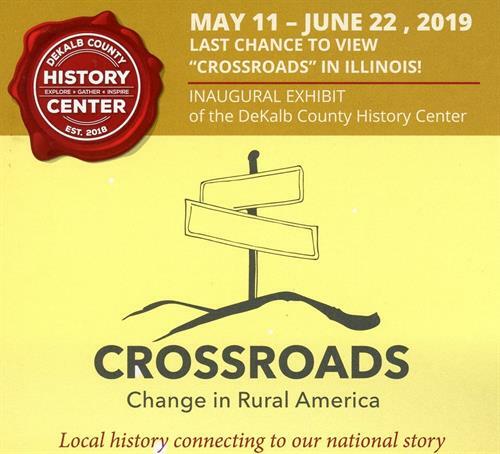 Traveling Smithsonian Exhibit: "Crossroads: Change in Rural America"
Come and join the DeKalb County History Center for the grand opening of our new museum! The museum's first exhibit will be a traveling Smithsonian exhibit titled, "Crossroads: Change in Rural America." The History Center could not think of a better first exhibit to hold in their new building. That’s right, the “Crossroads” exhibit will be held in the History Center’s newly built museum. The new space will offer a more accessible area for patrons to view exhibits as well as more archival space for the History Center’s collections. Make sure to stop in soon, the exhibit is only here for six weeks!